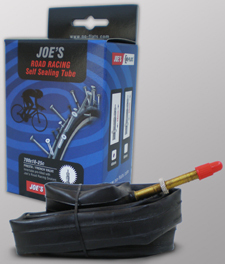 The Self Sealing Innertube and Road Racing Sealant are the two latest additions to the Joe’s No Flats product line. The most remarkable feature of the Self Sealing Innertube is that it is a very effective solution to prevent punctures for the high air pressures of road racing wheels. The innertube comes in 700X18-25C with a 48 millimetres or 60 millimetres Presta / French valve stem. It is made of high quality lightweight butyl and weights 70 grams. The Self Sealing Innertube is pre-filled with 50 grams Joe’s Road Racing Sealant. This is specially engineered to seal punctures at high air pressures of road racing wheels. The stuff instantly seals punctures in the tread up to 3 millimetres. The Joe’s Road Racing Sealant is also sold separately in 125 millilitre cans. It is easy to use as the spout fits into all valves. Normally 30-60 millilitre sealant per wheel is most effective at sealing punctures. One bottle is good for 2-4 road racing wheels.